Depending on whether you have a dog or a cat the situation is a little bit different. Cats do not cause much damage whatsoever to hardwood floors. They are generally much smaller in size and weight therefore their claws don't cause much damage. Dogs on the other hand are more prone to accidents as well as much heavier and can leave long and deep scratches in the hardwood surface. We will discuss your best options if you do plan on sticking with hardwood, some upkeep tips, and a few flooring alternatives if you’re not in love with hardwood. What is the most durable Hardwood? Not all hardwood floors are the same, each wood type has a different density level which causes varying durability. 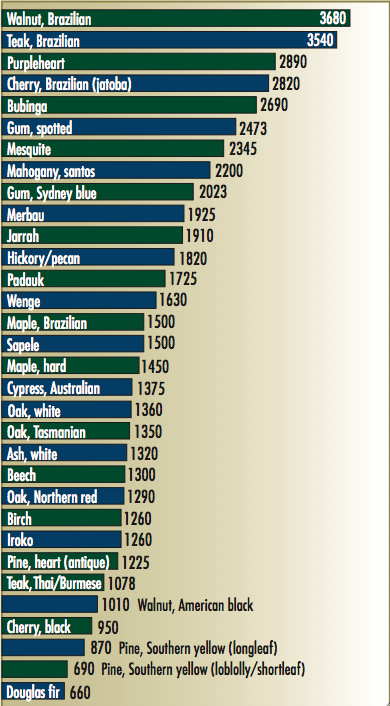 The National Wood Flooring Association rates the density of different wood options on what they call a Janka rating. The higher the rating the more dense and durable the wood is. According to this rating Brazilian Walnut, Brazilian Teak, Purpleheart, and Brazilian Cherry are some of the most durable wood types. If you want nothing but real traditional hardwood floors choose one of these wood types. Check out the chart on the right for a complete list. For maximum durability always go with Pre-Finished hardwood. Pre-finished hardwood comes pre-stained and sealed right from the factory. With multiple layers it is superior in durability and scratch resistant quality. Should I get Engineered Hardwood? Engineered hardwood is a great choice, it is one of the most popular hardwood flooring options in the pacific northwest. It is durable as well as ideal for moisture with its ability to expand and compress. Yet a downside to engineered hardwood is it can only take a limited amount of damage on the surface. Since the actual top hardwood veneer layer is only at the very top of the board, you can only re-sand engineered hardwood floors once or twice before running the risk of sanding below the hardwood veneer layer. Traditional hardwood flooring on the other hand can be re-sanded and re-finished multiple times allowing for a longer lasting lifetime and a more beautiful hardwood finish (without scratches or stains). How can I upkeep my floor and prevent damage? Millions of people are able to have both hardwood flooring as well as kids & pets in one household. With proper upkeep you also can keep your hardwood in great condition. Here are a few simple tips. Spills are one of the most damaging things to a hardwood floor. The acid in urine and vomit can stain hardwood floors very quickly if not cleaned up right away. Any other types of liquids will seep into the flooring from between the seams and will cause staining as well as liquid damage. Make sure you follow the above tips and you should be able to maintain a beautiful hardwood floor. What are some hardwood alternatives? There are many different flooring options available that resemble the hardwood floor look but are much more pet friendly and durable. If you are in love with the hardwood look but don’t mind having other material for your floor then here are a few options for you. Wood look alike porcelain tile looks almost indistinguishable from real wood, available as a result of advancement in imaging technology. Tile is much more durable than wood and will not scratch nor stain. Unlike wood, tile can be used in areas prone to moisture. Spills will not cause damage and can be easily wiped right up (even if not done right away). With current manufacturing technology porcelain tile can last a lifetime with very minimal care, yet unmatched durability. Vinyl flooring doesn’t sound like a pet friendly choice, but is actually a very scratch and stain resistant material. Vinyl flooring will not damage as a result of liquid spills due to its water resistance qualities, and is easy to clean and maintain. It is also one of the most comfortable flooring options because of its soft material. Like the porcelain tile it is also indistinguishable from real hardwood flooring due to advanced imaging technology. Vinyl is a cost effective and durable solution to a household with pets, and will not compromise on the hardwood look you desire. Unlike traditional hardwood, laminate flooring is more durable while offering similar design elements. Although laminate flooring is not as durable as porcelain tile or as luxury vinyl it’s a great choice for a solid wood flooring solution that is more durable than traditional hardwood and pet friendly. We are currently running a steep discount on some of our best selling laminate flooring options. Check out our online store to shop and order. Prices starting at just $1.57 per square foot. Hopefully we were able to help you out today and make your next home improvement investment the most valuable thing you do to your home. If you enjoyed this post, please like and share it, so your friends can read it as well. You can also like our Facebook page or follow our blog, we post home improvement tips and tricks weekly.